Josef Albers, Steps (JAAF 1976.1.1873) 1931/56, 16 1/2 x 21 1/4 in / 42 x 54 cm. Casein on masonite.©2014 The Josef and Anni Albers Foundation/Artists Rights Society New York/DACS London. 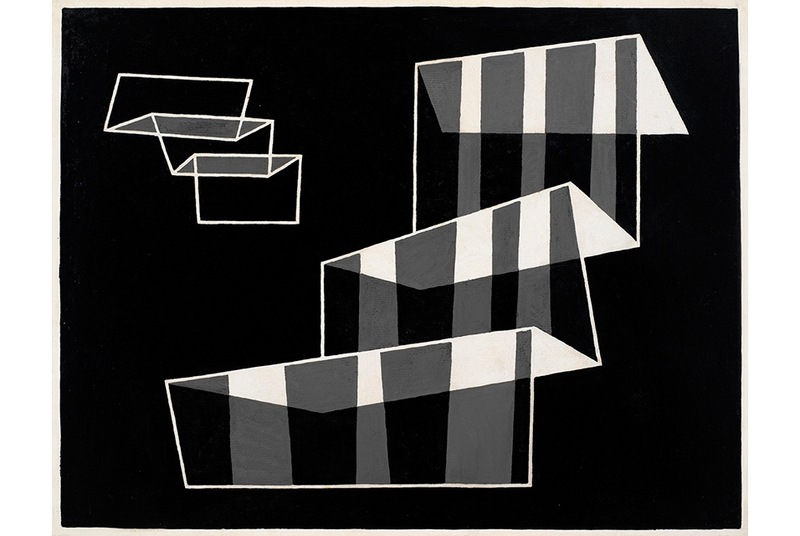 LONDON.- Waddington Custot Galleries present ‘Josef Albers: Black and White’ in association with the Josef and Anni Albers Foundation. This is the first exhibition to be held in the UK which explores the importance of black and white in Josef Albers’s work. Almost 50 selected works testify to Albers’s versatility as an artist. Featuring paintings, works on paper, glass works, photographs and engravings on vinylite, this exhibition promises a fascinating insight into his inventive journey. Albers explored the power of black throughout his life. His thorough use of black using multiple materials helped inform his knowledge and understanding of color. This self-imposed restriction to monochrome allowed him to approach the full spectrum with remarkable confidence. It was a similar approach to that of other great colorists: Georges Seurat restricted his palette to monochrome for two to three years in the 1880s and Henri Matisse focused on using black around 1918.